ChiroSpring is a fully customizable cloud-based chiropractic practice management software designed specifically for chiropractors. ChiroSpring is a top cloud-based chiropractic practice management software, with an intuitive user interface that makes it easy to use. Is ChiroSpring the right software for you? ChiroSpring is a fully integrated chiropractic practice management software that is ONC-Certified for Stage 1 and Stage 2 Meaningful Use. ChiroSpring has exceptionally strong documentation, billing, and reporting capabilities. Though it’s full-featured, we’ve found the software to be intuitive and easy to navigate. The company recently introduced a tiered pricing structure, which makes the system more accessible for practices looking for a no-frills budget-friendly EHR at $99/month. However, those looking to leverage all of ChiroSpring's functionality will need to pay between $249-$349/month, and potentially more, depending on if you have multiple providers, and if you use appointment reminders. Special offer for SoftwarePundit readers: Receive 25% off the first year of your ChiroSpring subscription if you sign up through our referral link. Founded in 2011, ChiroSpring has become one of the top cloud-based chiropractic software solutions on the market. Since it’s cloud-based, you don’t need to worry about purchasing additional hardware, or backing up your data -- ChiroSpring encrypts its data and backs it up in 3 separate locations across the United States 24 hours per day, so you can be assured that your data is safe. Many of ChiroSpring’s competitors are often backing up their data only on a daily basis. ChiroSpring was designed by chiropractors who were trying to solve the major pain points that chiropractic practices face when managing their practices. ChiroSpring boasts a 98% retention rate, all without having any contracts to lock in clients. However, if you do decide to try the software and cancel your month-to-month subscription, ChiroSpring will give you access to your data in a CSV file so that you can easily make sense of your data even after leaving. Many other software providers will either charge you for this service, or provide the data in a database or some other format which can be more difficult to manage, especially for those who are less tech-savvy. In contrast, ChiroSpring will provide all of your data, including SOAP notes, visit receipts, ledgers, etc. for free if you choose to switch to a different software provider. Another important feature that puts ChiroSpring ahead of the competition is the ability to support multiple practice locations, for those who subscribe to the Ultimate Package for $349/month. This means that for each location, you get a separate front desk and schedule, while still having one patient database. It’s also easy to add additional locations as needed. As you can see in the screenshot below, each location will be given its own dedicated front desk, and you can toggle between each location's front desk. You can also generate reports for each location, so you can analyze your practice's aggregate performance, as well as by location. We’ve found ChiroSpring to be extremely intuitive, and to have a low learning curve especially compared to some of its competitors with older, less modern software. ChiroSpring is highly customizable, and allows you to put only the information in front of you that you need. You can remove certain panels that you don’t find relevant, and you can also create custom macros to make your documentation faster. Another way that you can customize the system is by creating different security profiles for various employees, so that they can only access the sections of the software that they need. This can help bolster your practice's security by limiting the unnecessary exposure of sensitive information. The user interface is very welcoming and has a similar look as the iPhone or Mac home screen. The ‘front desk’ screen contains the most utilized apps at the bottom. These apps are just modules of the software with different capabilities. However, the system is fully integrated. Though the system’s UI resembles the iPhone/iPad start screen, the software can be run from any Mac or PC. 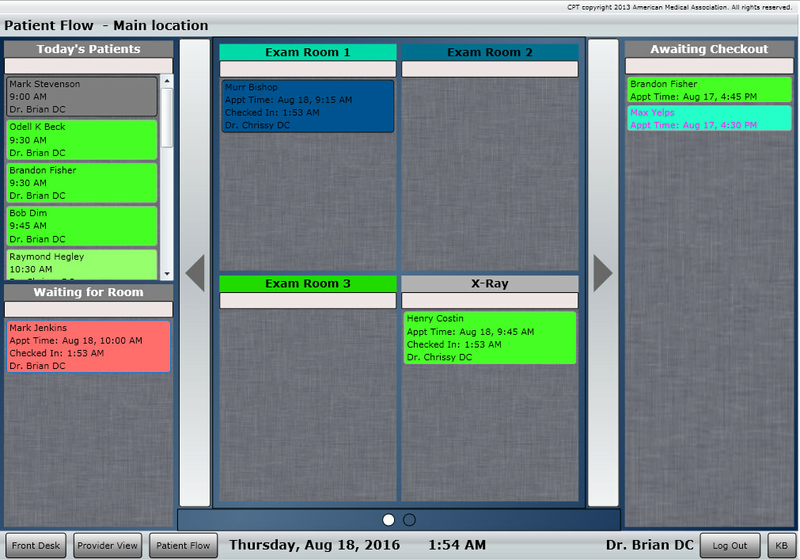 ChiroSpring can also be run on Windows 8.1 and Windows 10 tablets natively and has been designed to write SOAP notes entirely with touch. Users can also access the software on an iPad, but must do so through a remote desktop app, such as Splashtop. However, the software scales perfectly on iPads, so doctors who prefer iPads can still use the software. Below, we discuss the key features of ChiroSpring, and how they can benefit your practice. ChiroSpring makes it easy to create defensible documentation quickly by using just a few macros. 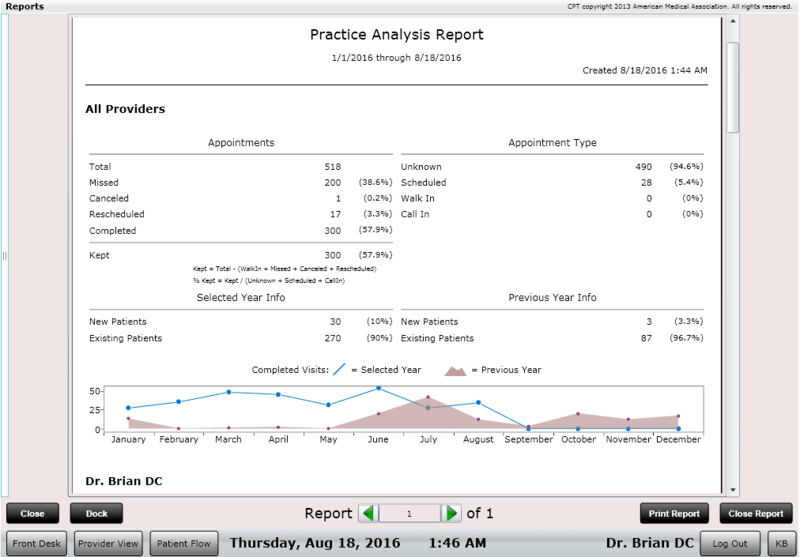 When you want to create a daily SOAP note, you can use the software’s chiropractic-specific macros as well as a touchable body for documenting complaints. Review of Systems is easily done using a touchable screen. Adjustments, charges and diagnosis are also added with fully customizable touch grids. All of this information populates the daily note. Each note is saved, which means that on subsequent visits, you will only need to describe changes to the patient’s symptoms, which makes filling out the daily note a very quick process. It’s also easy to describe the pain that the patient is having, and the magnitude of the pain just by tapping a few buttons on a body chart. 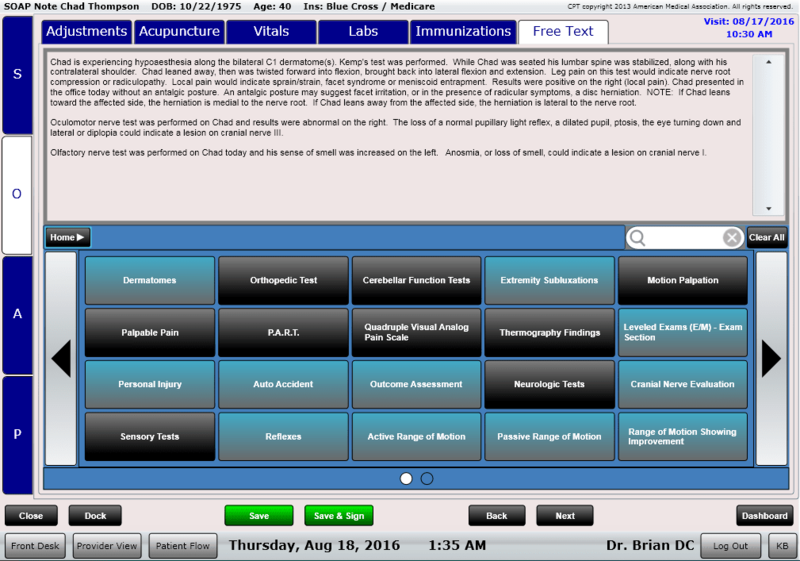 You can also have a large portion of your subjective note populated by your patient using ChiroSpring's Patient Kiosk. This includes review of systems, complaints and custom intake questions that populate in narrative format. The software comes pre-loaded with hundreds of chiropractic-specific macros, but since ChiroSpring is fully customizable, you can make sure that the macros you use the most frequently are easy to access, and remove the macros that you never use. You can also create your own macros. ChiroSpring has a library consisting of all of the ICD-10 codes, but also maintains a smaller list of ICD-10 codes specifically for chiropractors, which makes it easy to find the right code. You can also keep a list of favorite ICD-10 codes that you use frequently, which makes it really easy to find appropriate ICD-10 codes on the fly. Since chiropractors often see patients across multiple visits, one documentation feature that we really like is that the software will chart the patient’s progress for each complaint over time. This is great because it can show insurance companies the patient’s progress, which can justify subsequent visits. 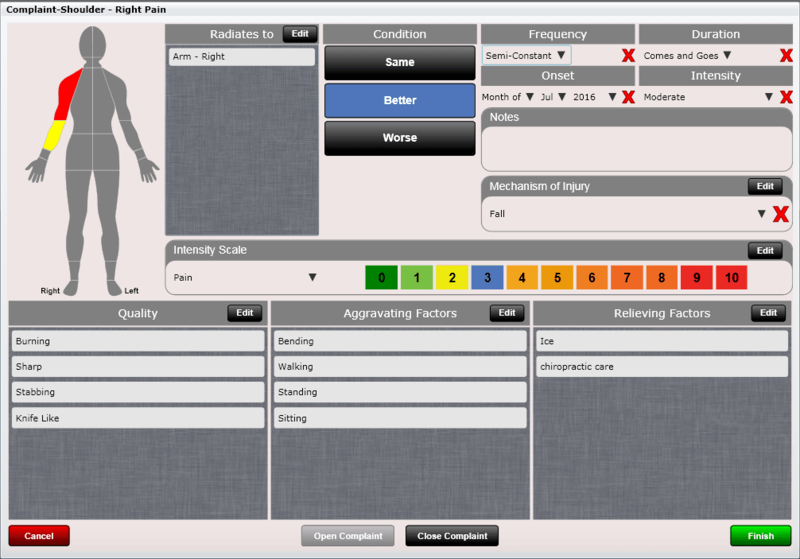 Recently, an evaluation tab has been added to the software, which enables the provider to document things like range of motion, muscle strength testing, reflexes, and more entirely with touch. Previous data is also retained so that on follow-up visits, you only need to update any changes from the most recent visit. 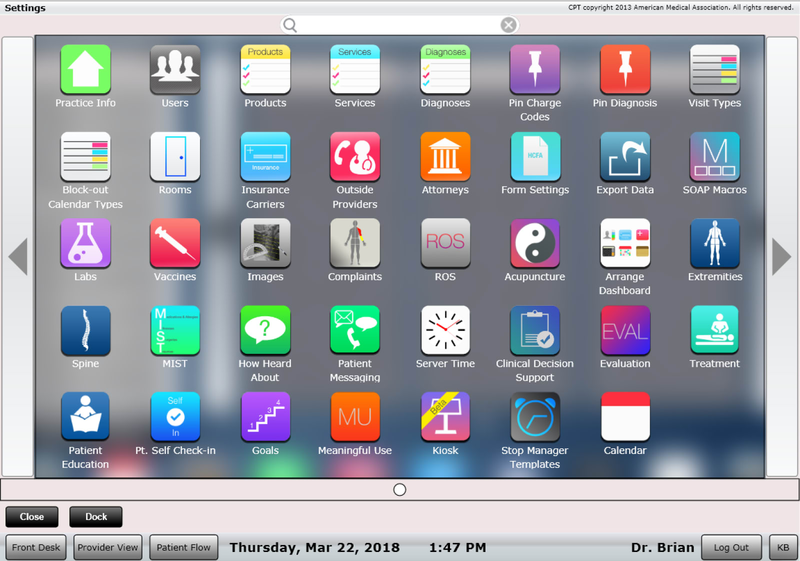 In March 2019, ChiroSpring launched its "ChiroSpring Share" app, which allows chiropractors to share SOAP macros that they've created, and also download macros that are used by other doctors. These macros are useful in supplementing the pre-installed macros that come with ChiroSpring. The billing app in ChiroSpring keeps track of all claims, and of all the money that is owed to you by insurance. The billing app separates all claims into different folders, such as unsubmitted claims, disputed claims, and claims that are on hold. As you progress through your billing queue, claims will automatically be moved to the appropriate folder. For example, when you submit a claim that was previously in the unsubmitted folder, the claim will automatically get moved to the submitted folder, which makes it easy to manage your billing queue. You can easily edit claims from the billing app by tapping or clicking on any claim, which makes it easy to add or modify codes, or resolve any issues that the claim may have. After learning why a claim was denied, you can easily resolve it from the billing app, and then resend it. The claim will then be moved into the appropriate folder automatically. This makes it really easy to manage your payment queue in one convenient location. The claims app shows you all the claims that are ready to be exported. When a SOAP note is signed by the provider, the HCFA is automatically created -- there’s nothing that needs to be done manually. The software then generates a file of claims that can be uploaded to any clearinghouse. If you don't already have a preferred clearinghouse, ChiroSpring recommends Office Ally, and their free clearinghouse. Once claims are processed, they automatically get removed from the queue, but will still be stored in the ‘submitted claims’ folder in perpetuity until reconciled. When payment is finally received, you can then reconcile payments through the software. The software also offers quality assurance checks to make sure that the payment balances out, which helps prevent typos or arithmetic errors. 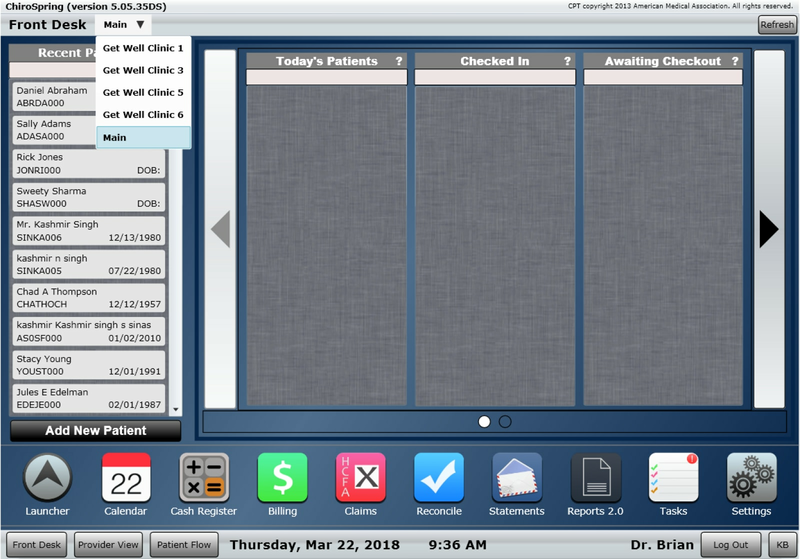 ChiroSpring’s scheduling capabilities allow you to manage your schedule across multiple locations, giving you multiple calendars and front desk instances, while still using one patient database. Using the software, you can schedule recurring appointments, and also book multiple patients at the same time (in the event that certain patients are at high risk of missing their appointments). To help reduce the risk of a patient missing his or her appointment, you can send automatic appointment reminders, which we’ve found to be very helpful. 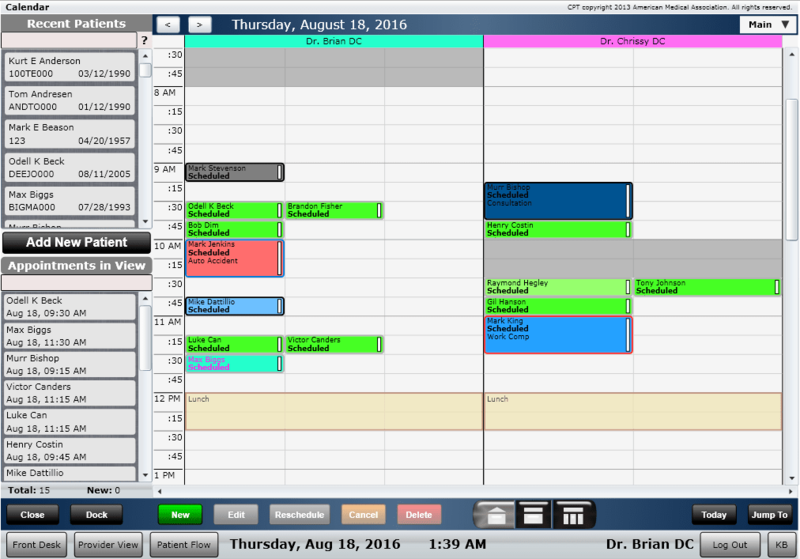 As with most software, the scheduler allows you to color-code appointments, and allows you to view each practitioner’s schedule in one view. As with the rest of the software, the scheduler is completely customizable. Doctors can set their calendar color, or specify how many patients they want to schedule across a given time slot. If you need to quickly access patient information, you can access it directly from the scheduler just by hovering over the appointment block. Once the patient has checked in, you can track them as they move from the waiting room to the exam room through the calendar. This also helps keep track of which rooms are currently being used and which are available. ChrioSpring calls this ‘Patient Flow’. Rooms can be customized to meet your practice’s needs. As the patient finishes their visit, they can be moved to the next phase of the process which is ‘Awaiting Checkout’. This will let staff know the provider is ready for the patient to be checked out. A nice feature is that the doctor does not even need to complete the SOAP note before allowing the patient to be checked out. 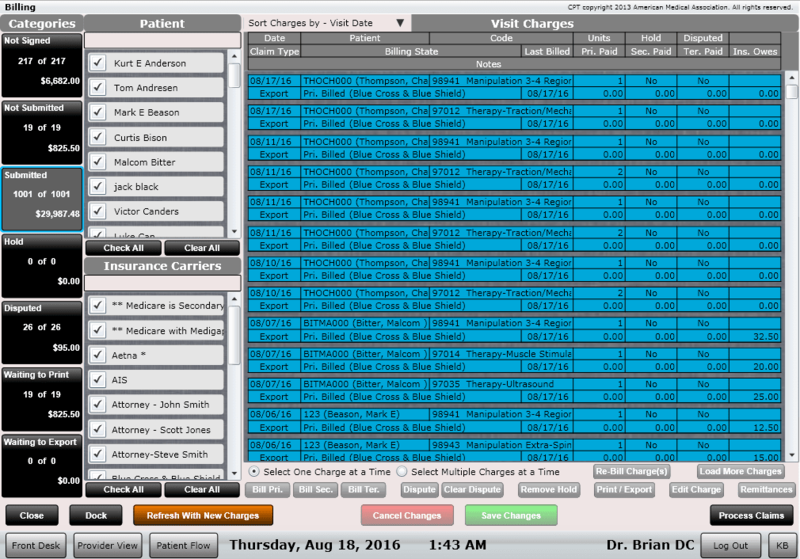 To help reduce no-shows, ChiroSpring offers automated patient appointment reminders through a third party. For a nominal fee, clinics can customize messages to send to their patients and specify how the patient would like to be contacted, either via email, text message, or voice reminder. These reminders should lead to less patient no-shows and free up clinic staff so that they can focus on more complex tasks. ChiroSpring comes with a suite of reports to help you analyze and optimize your business. Using the built-in reports, it’s easy to monitor your finances and compare this year’s revenue to last year’s, and also identify the top referral sources, or identify insurances that are denying your claims the most. The reports that ChiroSpring offers are very thorough, customizable with various filters, and can be run over various time horizons. Many of the reports come with easy to digest graphs, which we’ve found to be helpful. As of April 2017, ChiroSpring now includes a customizable patient kiosk as part of its Accelerate ($249/month) and Ultimate ($349/month) packages. The kiosk is a powerful tool that can help practices move towards a paperless practice. Each practice can customize their kiosk with specific forms and questionnaires that they'd like patients to fill out. Once the patient fills out this information (on a laptop or tablet), the information will immediately be uploaded into the patient's ChiroSpring profile, so that you won't have to manually enter this information yourself. All subjective information including review of systems, complaints, medications, allergies, and problems can be completed entirely by the patient. Transitioning to a paperless practice will greatly improve your patients' experience, and will also make it easier, and more secure, for your office to keep track of patient information. Also as of April 2017, ChiroSpring offers integrated payment capabilities. This enables practices to accept credit, debit or bank (ACH) payments, and have these payments automatically post to the patient’s ledger in ChiroSpring, so that you won't have to manually enter payment information. You can also securely store payment information, so that you can schedule recurring payments, which can help streamline the patient's experience and help you manage Care Plans for patients. 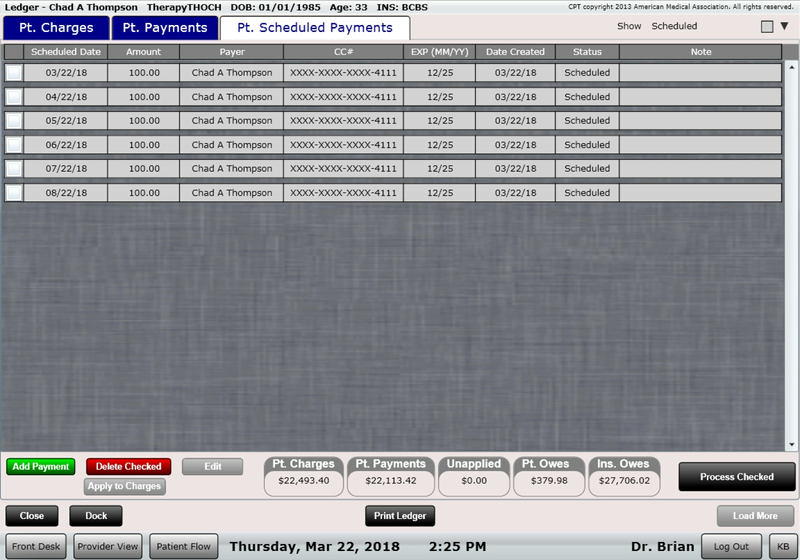 In the screen shot below, you can see we created six recurring payments for a patient at $100 each. This functionality is included in all price tiers, and comes at no additional charge, whereas many other systems will charge for these capabilities. With ChiroTouch announcing that SmartCloud will be sunsetting in September 2018, many practices are now looking for other cloud-based EMR options. With the deadline approaching, one of the biggest challenges practices are facing is the ability to transition their SmartCloud database to another system. This process needs to be seamless without resulting in any downtime, and ideally without any additional charges. To help facilitate the transition from SmartCloud to ChiroSpring, ChiroSpring is offering SmartCloud users free data migrations, and 25% off your entire first year subscription if you sign up through our referral link. If you are looking for a cloud-based chiropractic practice management solution, then ChiroSpring is a top choice to consider. It’s intuitive, and has the important features necessary to help run your chiropractic business, without any of the unnecessary bells and whistles. The software is fully integrated so you won’t need to purchase additional modules or work hard to access data from different parts of the program. With over 98% customer retention rate, ChiroSpring is one of the top chiropractic practice management solutions on the market. At about $249/month, the price is also about average in comparison to other cloud-based solutions, and has a lower startup cost than many of its license-based alternatives. We also like that ChiroSpring is transparent with its pricing. If you're looking for more information about ChiroSpring, you can visit their site here. You can also read our interview with Tracey Harju (Office Manager at Water's Edge Chiropractic) to learn why she chose to use ChiroSpring in her practice.